Something that you may not be aware of is that lead acid forklift batteries are composed of 2 volt cells arranged in series of 24, 36, or 48 volts and just because one or more of these 2 volt cells is weak or shorted out it does not mean that the battery is junk and you have to replace it at a cost of thousands of dollars. There are small companies that can test each cell, locate the bad ones and remove and replace the bad cells at a far less expensive cost than replacing the entire battery. We are currently building a directory as a service to our Battery Chem customers so they can locate the nearest forklift battery repair company to them whether they purchase our products or not. We are already shipping plenty of product every day as it is. Battery Cell failure is strictly a maintenance problem. Many of these failures are caused by SULFATION AND BAD WATER. In these turbulent times for small businesses with many just hanging on by a thread. Imagine having a very important shipment all packed and waiting to be loaded into a shipping container backed up to your loading dock waiting for you to load it and sent to the port. It must leave that day to make the ship on time. You are a small company and only have the one forklift and suddenly in your moment of need you find that your help has been ignoring it and mistreating it very badly. You discover that the battery is dead becausethe proper maintenance program has not been followed. There is no way you can use the forklift and a new Battery can cost $6,000.00 because when they are cooked they are cooked!. This is not a pretty picture and we see this all the time. Battery Chem is not Snake Oil ! Battery Chem is rapidly coming up on 30 years of successful business. If we were selling Snake Oil this could never have happened. Battery Chem can double or even triple the life of large forklift type traction batteries and has revived 70 percent of the weak batteries that it has been applied to. OUR TESTING AND MAINTENANCE PROGRAM IS FREE. You can compare the specific gravity reading of a battery to the fuel gauge on a car. Let's use electric golf cart or electric forklift batteries for examples. A lead/acid battery pack that is fully charged at a specific gravity of 1.265 has much more electricity (energy) stored in it than a battery pack with a specific gravity reading of 1.200 which is very low. It's like going from full gas tank to an empty gas tank in terms of fuel. Batteries are rated in amp hours of storage. The more amp hours of electricity stored the more fuel you have in your tank so to speak. Batteries with high amp hours of actual energy stored will propel your vehicle further than batteries with very few amp hours left in storage. As a battery ages it loses efficiency. Contributing factors to the loss of efficiency in a lead acid battery are low water, not using distilled water, over charging, under charging, improper charging, sulfation, damaged battery acid, short circuits, mechanical failure dirty contacts and broken wires. The output voltages on your battery chargers should be checked often. We prefer flooded lead/acid batteries with service caps with the emphasis on service. When used with the proper service our additive products Battery Chem and Battery Balancer can double or even triple the lives of your heavy duty batteries. In order to maintain your batteries properly you will need an inexpensive specific gravity tester and a volt meter. Here is a very useful video to show you our testing method. We can double and in some instances even triple the live of your deep draw batteries. Having been in the business of manufacturing lead acid type Battery Reconditioning Chemicals and reconditioning many of these units since the mid 1980's I have seen more than my share of mistreated and neglected golf cart batteries as well as all the other types of lead acid batteries. Like all batteries golf cart batteries receive more than their share of both owner and employee neglect. Most of the complaints that we are hearing about and solving are caused by low water, undercharging and sulfation. We have found over many years of experience that our time tested product Battery Chem has helped to restore many of these batteries by helping to remove sulfation, lowering charging temperatures and reducing charging times. We offer our dealers free training on the proper use of our product. We do not charge any fees or percentages from our dealers and we are not selling licence's or franchises. We just want to manufacture and sell our chemicals. We have the new required SDS forms and ship world wide (Formerly MSDS forms). Our web site is www.BatteryChem.Biz and we are a time tested world wide company. We are aware that states like Florida have many seasonal residents who own golf carts and that in many cases these units are left sitting in storage for up to six months just lying dormant so to speak. By adding Battery Chem to these batteries before they get a chance to fail you can greatly extend the useful life of these batteries. If one of these batteries has already failed due to neglect like sulfation, undercharging or low water and providing none of the cells are totally shorted out you can greatly extend the life of these batteries by adding Battery Chem and these batteries will improve in performance with each successive recharge 70% of the time. I urge you to visit our free training site www.BatteryChem.Biz and learn about our company and time tested methods. Twenty-Seven years of repeat business is a pretty good record. In my over 60 years of sales and marketing I have seen my share of problems involving new startup businesses and old line well established companies. There comes a time when the product sales just seem to dry up and you just can't seem to make a nickel. I have seen my share of recessions come and go ever since the 1930's. I was old enough to understand that my Dad just couldn't seem to get a job during that period in our history. We seem to have been in and out of these bad business cycles my entire life and yet I still know of companies that have ran successfully the entire time before, during and since the great depression. There are several reasons that these companies have always succeeded. The main reason is that they had products that were always in demand. They still faced competition like all of us do, but the smart companies always saw to it that they had an edge on the competition. Things that give you an edge are price, quality, customer service, brand recognition and a good strong marketing program. The simple fact is that you can offer the best products, prices and services in the world, but if people don't know you even exist then you are doomed to failure. Here at Battery Chem we are constantly researching for new marketing ideas. We especially look for ideas that will not cost our associates a fortune because we know that money is tight these days. So it really boils down to how hard are you willing to work to get those badly needed customers and accounts that you need to succeed? I would like to review what kinds of very basic things that you should be doing in order to market your products successfully. You need to establish a name, location, phone number and hopefully a web site for your new company and all this should go on a business card even if it takes both sides of the card to make it look professional enough. The name of the business should reflect what the business does. Like "Battery Service and Reconditioning" or "Battery Sales and Maintenance". I'm sure that you get the idea. There should also be Key words on your Web page so that Google's search engine will pick up on them. Here are some examples of Key words, separated by commas. Batteries, lead acid batteries, battery, reconditioning, maintenance, cars, buses, trucks, golf carts, electric forklifts, rebuilding, repairing, distilled water, repairs, service, etc. These key words draw customers to your pages; we put them on all of our videos too. When you make your web site be sure to put your full contact information and your photo on it. No one wants to deal with nameless, faceless suppliers or service people. Let us make a free video for you to place on You Tube and embed in your web page. Word of mouth is excellent. Hand everyone you meet a business card and tell them what you are doing. Ask them to pass the information along to their friends. Go to large warehouses and leave a card with the person in charge of paying the bills for their forklift fleet. You will quickly get their attention. These forklifts are highly subject to employee neglect. Sulfation, low water and undercharging are the leading causes of major battery failures. Do the same for golf cart and other equipment fleets of vehicles that depend on lead acid batteries for their efficient operation. Don't be afraid to talk to people because you are providing them a needed service that can save them thousands of dollars. As I always like to say, "Who doesn't like to save money"? Calling, mailings and face to face visits are the number one way to get new business. Believe me, when I was a young man and a shy country boy I had to force myself to do it, but it paid off. Business is not for the timid or the faint of heart. To summarize, tell everyone in sight who you are, what you do and where to find you. Be sure to make it clear that you will stand behind your product and your workmanship. If you keep your customers happy they will send you hundreds of new customers and if you don't keep them happy you will pay a heavy price. There are many shoppers' guides around with very low or free advertising rates in them. We have had good luck over the years with them. Your local Craigslist is an excellent source of sales leads. Also, any publication that reaches company owners or executives is a good bet because they are really concerned about the bottom line and you are offering to save them a great deal of money. An electric forklift battery can easily cost up to $8,000.00 dollars to replace and golf cart batteries can run up to $1,000.00 a set to replace. If you can afford it, you can try some ads on the local cable channels and radio stations However, I do not suggest spending too much money on radio and TV. If you can set up a booth at local trade shows and also sell Battery Repair kits at flea markets and swap meets it's not a bad way to go. There is a very strong do it yourself market out there that you can take advantage of. The main thing is to use your imagination to promote your products and services. Do whatever you have to get your message out there to the marketplace. In case you are interested our company is rapidly expanding here and overseas. We can supply you with video ads for your web sites if you tell us what you need imprinted on them. Please don't forget that you can always sell new batteries too. We can help you with that if you need it. I will be writing to you more about this in the near future. 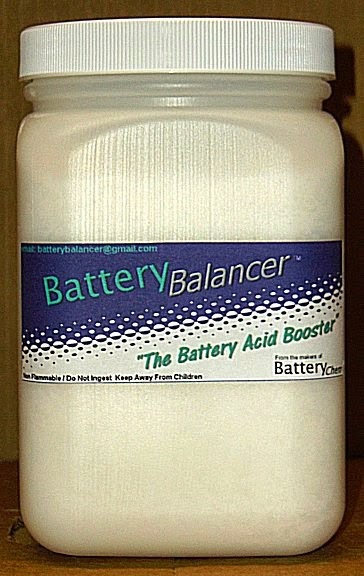 If you have any questions or problems please do not hesitate to contact me at 401-725-8141, www.BatteryChem.biz. P.S. I had very good news today. I was just told that I have one of the top 5% most viewed LinkedIn profiles for 2012. This just shows that many people are interested in saving money. A Battery Chem business could change your life and your financial outlook! Visit our website today...www.BatteryChem.biz and see for yourself.